February | 2013 | Can Men Cook? Well, at least the beefburgers were not contaminated with beef! As I said in a previous post, I really don’t think this is the point. Most people are now blaming the FSA (Food Standards Agency) for not testing enough. Sorry – they are not the culprits here. I don’t think it is even the producers. Food labelling is a scandal in the UK. The supermarkets – who seem to hold producers to ransom and squeeze their margins mercilessly and are the cause of a lot of food waste before it even gets to the shops have continued to resist open labelling for years. Shouldn’t we know the origin of our fresh foodstuffs? They know we would run a mile from a £3 chicken if it boldly said “Lived in (insert far east country of your choice), in a cage with 45 other birds so you can have it at this ridiculously low price”. OK – that’s silly. But wouldn’t it be good that the label said China or Thailand or wherever, so you could make an informed choice? We could be inadvertently importing animal cruelty without knowing it. We could be helping bird flu and swine flu get a hold in the world because they want to keep the origin of our food quiet. Time to force them into common sense and honest labelling. I like to know what I am buying. I’m sure you do too. Last year, my most read blog was “As promised – foolproof rice every time!”. (Link – http://wp.me/p1kDxL-p ) This post is in the same spirit. Potatoes seem to scare people! Mashed spud is just one of those most comfortable feeling, soul enhancing things in the world. Perfect for winter stews and sausages in onion gravy! It was hearing my niece saying that she had never made mashed potatoes with any great success. She is 1/4 Irish, so really does need to master the skill, what with the centrality of the potato to Irish cuisine (and the sad history of the Famine). So, for M, her son, and all of you – this is lifted straight out of my book! (http://amzn.to/XnDkXq ). Because of that, it is silly and biased towards a male audience. I apologise to all my female readers – and it is sad to know that men seem to like this sort of stuff! My mum was excellent at making this, so much so that this is her method (sadly, she can’t make it any more – the ravages of age and progressive vascular dementia. She would be very proud to know this was here). Mum did make the best mashed spud ever. She never really liked cooking, thinking of it as a bit of a chore . But some things she did really well. And mashed potato was one of them. (the others were chicken soup, pea and ham soup, apple pie and Scouse). Betty’s Cheap and Cheerful Cream of Mashed Potato. 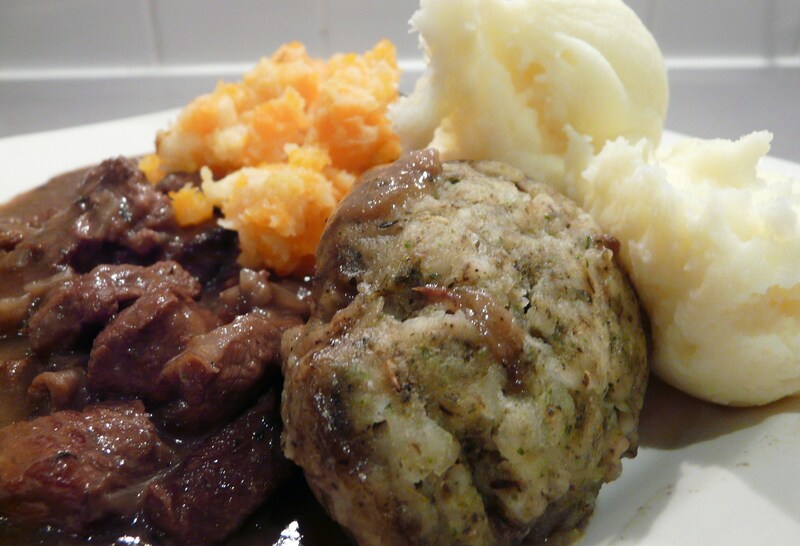 You can just spot the mash behind the dumplings! Look, there are some things in life that are just a comfort. You never had anything sissy like a teddy bear, or a scratty piece of cloth that you wouldn’t let out of your sight when you were a babe in arms, I’m sure. Now, the major comforting thing you need is a babe in your arms, a cooling pint of beer, a sausage roll, or, just maybe, some gorgeously unctuous mashed potato with anything at all. This is so easy to screw up. Many of you will remember school dinners with abject horror. Except of course, for that chocolate sponge pudding stuff, with the pink custard. But the mashed spud with the occasional uncooked gristly black and lumpy bits in it, and all the eyes and other non-recognisably vegetable stuff – well, I could go on, but I feel a bit sick. And even in the poshest restaurants, they bugger this up the other way – over doing it – usually because it is done in a food processor. You end up with a thick wallpaper paste. Fine if you are decorating, but why eat it unless you have your jaws wired together? Let’s get this right. If you can do mashed potato that gets favourable comments from your loved ones, then it doesn’t matter if you are not Brad Pitt. And your best beloved will not care quite so much about your inability to squeeze the toothpaste from the bottom of the tube. So, here goes. 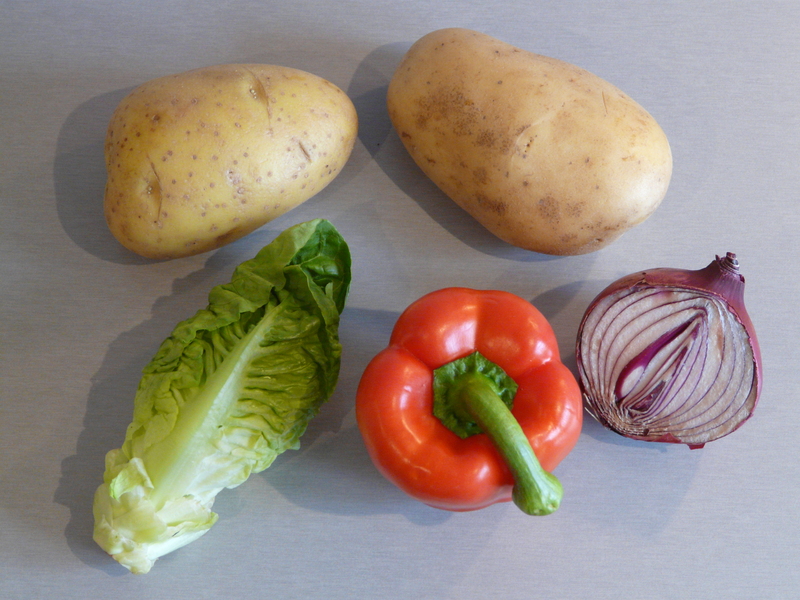 Potatoes – about 7 little – ish ones, or three big ones about 500g or a bit over a pound for 2 people. They need to be main crop, big potatoes not “new potatoes”. Sorry, I hear you say. How can this go wrong when there is the square root of bugger all in it? Just see above for the professional cooks who get it wrong. Some types of potatoes seem better suited to mashing. Old seasons spuds – also called main crop – are the only ones to use. New potatoes are too waxy and exciting done whole anyway. I like the red ones, and King Edwards. But Lincolns and most other main crop ones work well, too. Being seasonal, it does seem to depend on how they have been stored by the supplier. The biggest worry is those that turn to mush three seconds after you have last tested them when they still felt hard. In life, you can put this down to stress, or drink, but with spuds it’s just part of their make-up. Peel the spuds with a Lancashire Peeler. Wash them. Cut them up into equal size pieces. Most spuds cut best into two or three pieces, about the size of a tomato (but obviously, not round!). Put them in a pan and cover with boiling water. They take about 20 minutes to cook to the point where they are mashable, but I suggest putting a timer on for 15 minutes, because the buggers have a habit of disintegrating when you least expect it. To check on readiness, poke a couple with a kitchen knife. Stick it right in, and lift the spud up. SCIENCE BIT: We are going to let gravity help us in this experiment. As you know (or will now claim to remember), things weigh about 1/6th their weight in water as they do in air. So, as you lift the spud out of the water, it will suddenly get heavier. If it slides off the knife easily when it is over half way out of the water, then it is just about ready for the next phase. If it is not nearly done, you will feel a gritty hardness when you push the knife in. So, you need to poke them again. (Can someone tell young Smithers from 4b that this isn’t funny)? With a skewer, or a little knife. If it feels non-crunchy, and the spud slides back off the knife, then you’re just about there. Make sure you poke more than one (Smithers – stop now) especially the biggest one, which will take the longest. If you’ve left them too long, they’ll have fallen apart a little bit. If you’ve forgotten about them, they’ll have either turned into a wallpaper paste like mess, or worse, burnt and stuck to the bottom of the pan. Just a thought – do you think we could get rid of knife crime if we got teenage tear-aways to cook? They could use knives usefully? Pour the water off the potatoes. Look up potato masher on the web site, and find it in the drawer. I can’t do this with a fork, and I’ve already said I don’t like using food processors for this. Spud mashers were invented to make the creation of perfect mashed potato easy. So, use one. Crush them with the masher for about 45 seconds. At first they will be all lumpy. Gradually, they will start looking fluffier. Now, add the knob of butter – quite a big knob, about a dessert spoonful. Now continue mashing until all the butter has gone in (so there are no obvious yellow in spots). Then add a splash of milk – probably about 3 dessertspoons. AN ASIDE: Women always say that they won’t let their semi trained male cooks anywhere near the kitchen, because afterwards it looks like a bomb has hit it, and every single implement has been used and is unwashed. Now here’s your chance to start changing that lazy habit. Use the same spoon as you did to put the knob of butter in. It doesn’t matter if it still has butter on it, does it? It’s like forgetting to tell her how gorgeous she is looking today, or not noticing the new hairstyle, or forgetting anniversaries. You need to get in touch with your feminine side. Take a fork, and whiz it round and round in the spuds until they become hyper fluffy. Taste a bit. (Make sure no one is looking, because they will think you have contaminated the food). If there is any sign of grittiness or lumps, get back to forking away to your heart’s content again. Add a tiny bit of salt, and white pepper (or ground black pepper if you can explain to people what the little flecks of black are in your masterpiece). Put this onto plates, with a sprig of parsley if you have any and are feeling a bit pretentious (Moi? ).